Here we share the official link to Download Huawei P9 Lite B397 Nougat Update for the VNS-L21 variant. The Huawei P9 Lite B397 Nougat Update adds a new split-screen key to WhatsApp message banners, adds the Recently deleted album in Gallery, adds a security procedure that requires you to enter your lock screen password every three days, optimizes Camera performance for faster shutter response and integrates March 2018 Google security patches. 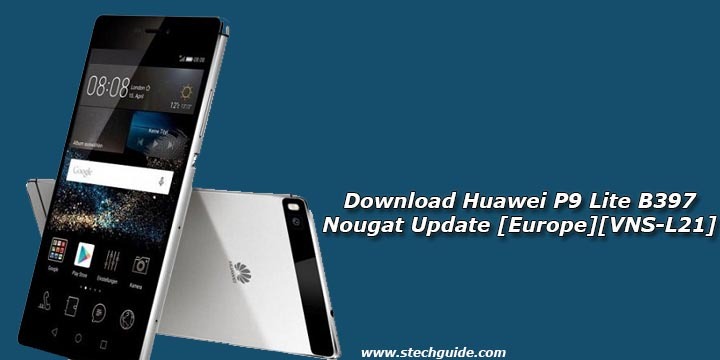 Download Official Huawei P9 Lite B397 Nougat Update files from below. Huawei P9 Lite, the successor of the P8 Lite, is a third variant of the P9 series. The phone features a 5.20-inch FHD display with a resolution of with 1080 x 1920 pixels. The Huawei P9 Lite powered by a 1.7GHz octa-core Kirin 650 processor with 3GB of RAM. The update only works on European variants (C432), Middle-East or Asian users (C185/C636) not try this on your phone. Download Huawei P9 Lite B397 firmware from below. 1) First, you need to unlock the bootloader of Huawei P9 Lite and download and install a custom recovery. If you already had an unlocked bootloader and custom recovery installed on your device then skip this step. 2) Download Huawei P9 Lite B397 Nougat files from above and save it on your device.